I feel like I’m always chasing someone or someone is chasing me. And this is with only 2 kids. Sometimes, I feel like my mind is left behind while I’m running around like a chicken with its head cut off. Somehow, most of the time, I manage to pull off looking as if I have my act together with the help of few life-saving products. Dry Shampoo: If I can have one and only one of these products, that would be the dry shampoo. Dry shampoo is the best thing before…, nope, it’s simply the best thing ever. I have oily hair and it shows when it’s not washed for 2 days. Sometimes, I just don’t have the time to wash and dry my hair so I always have a can of dry shampoo available. I keep few extra in stock. After trying out many brands, my current favorite one is “Not Your Mothers Clean Freak Refreshing Dry Shampoo”. 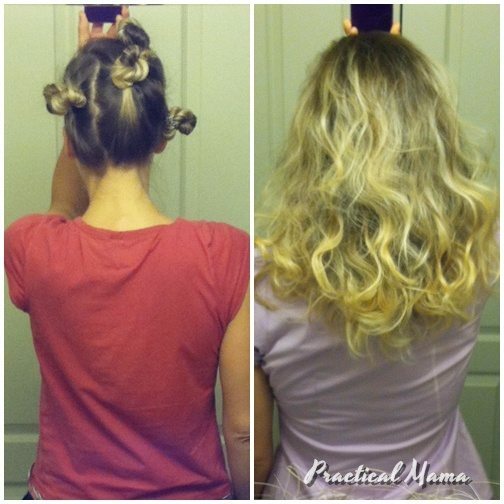 It’s simple to use and gives you an extra few days until have time to wash your hair. 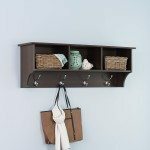 Entryway Organizer with key hanger and cubbies: When you are on the run, getting out of the house with the most critical items you need to have with you such as your keys, cellphone, wallet, sunglasses etc. becomes a flag race. 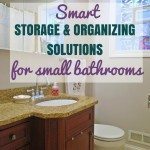 This solution that helped me have one place for my house and car keys, my purse, sunglasses and anything I need to pick up getting out of the house right by the door. 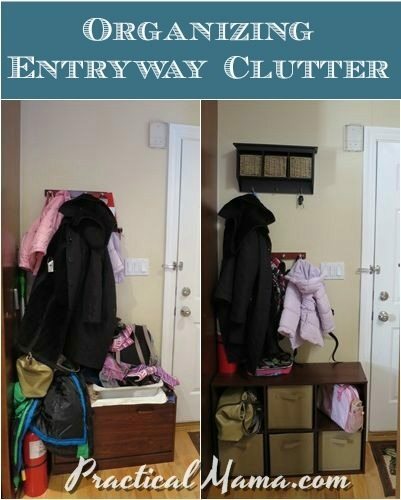 I wrote more about my complete entryway organization in this post including cubby storage for hats, gloves, scarves and misc items all family members need when going outside. Every time I come home, I hang my keys, purse and put my sunglasses in those little cubbies. That way I reduce the risk of losing them in the house. 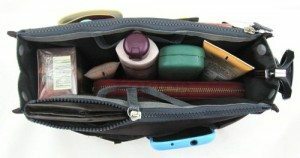 Instert Handbag Organizer: My husband’s worst nightmare is for me to tell him to go look in my purse for something he needs because he calls it “the black hole“. I know moms will believe me when I say, I can find anything I want without even looking in my purse. It might look cluttered but everything has it’s place and organized in chaotic sort of way. I have a butler handbag from Avon that already has the organizer built in. These insert purse organizers are very handy because you can just switch between handbags without worrying about forgetting an important item behind. 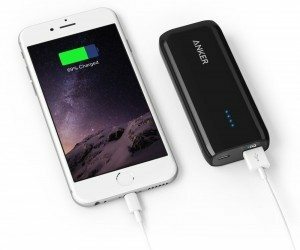 Compact portable cellphone charger: If I know I’ll be out and about all day, I won’t leave home without my portable charger. I use my phone for everything. 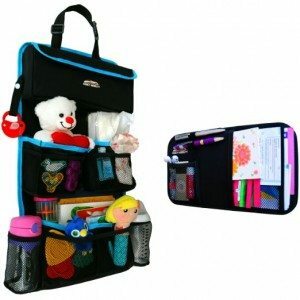 Communication device, GPS, Recipe book (for ingredients during shopping), grocery list, to do list, camera, mirror, mps3 player, whether channel, tourist guide (when traveling) and entertainment center for kids. I am quite dependent. I cannot risk my phone running out of battery. When I use it, I charge it soon as I get back home and have it ready for next time’s use. Clogs: These clogs are the simplest but comfiest things ever. Especially when you are hurrying out to get the kids to school on time. It doesn’t matter whether it’s cold or snowing outside or you don’t have socks on yet, these clogs will get you to school drop off, pick up or emergency grocery stop. 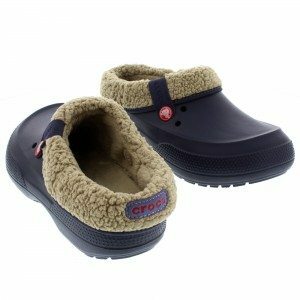 They are easy to put on, warm and comfy. The fleece liner is removable. When summer comes, flip flops are my best friends. Until then, these clogs are my life savers. Backseat Car Organizer: First of all, even if you don’t get this one, simple backseat car protector kick mats are a must as soon as your child sits forward in their car seat. 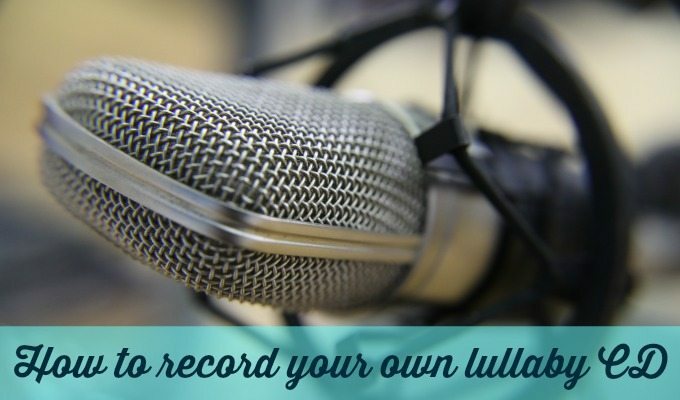 For longer car rides why not use the same space for organizing all the clutter you need for entertainment and feeding. 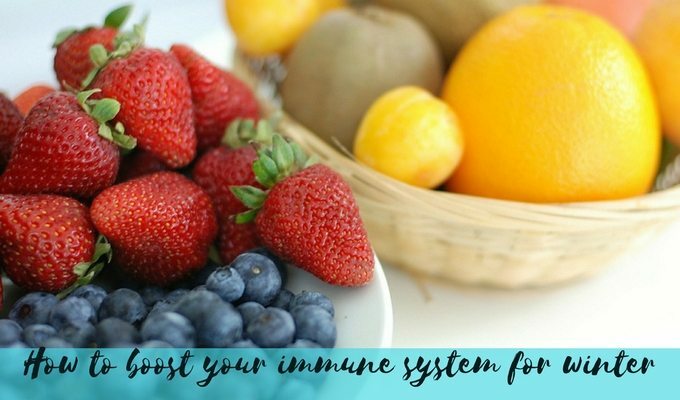 For daily use, you can keep tissue paper, wet wipes, a notebook, few crayons and pens and simple toys. Birthday and Greeting Card Set: Once your child starts school and you start running from birthday party to birthday party, procrastinate to get ready for school related activities and gifts for school staff during holidays, you’ll need one less thing to worry about: Greeting Cards. Buy a box once and don’t worry about the cards for at least 6 months. 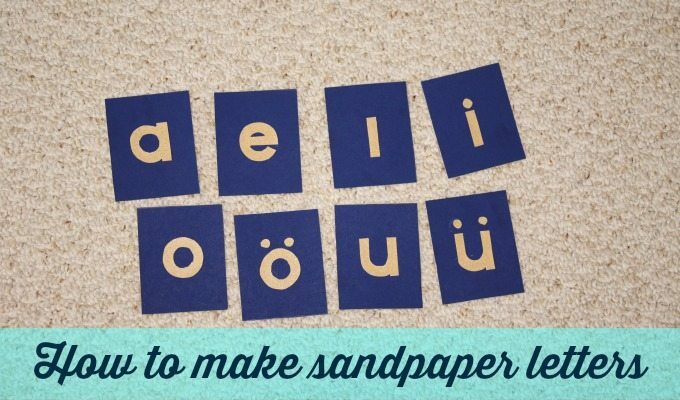 When your kids grow older, you can also get this DIY Make your own cards set for your kids to create personalized greeting cards. 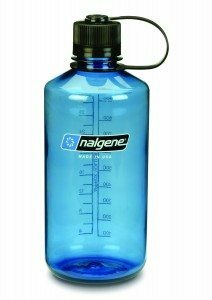 Water Bottle: If I’m sitting in my office all day, I’m really good at getting my fluids in, but when I’m running around during the day, I forget drinking water and I get dehydrated without noticing. Then I feel hungry, instead of thirsty and start searching for snacks. I keep my big water bottle close during the day even if it’s heavy when it’s full. Especially when traveling, going through security at the airports, I just empty them out and fill it up at the next fountain. I don’t have to pay an arm and a leg for a bottle of water at the airport. Even when in the city or just the neighborhood it minimizes my use of plastic water bottles. 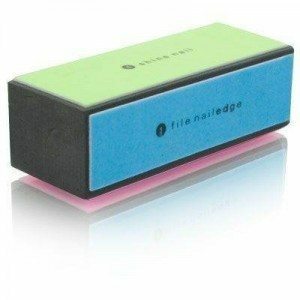 Nail Buffer I wrote about this product in my post on nail buffing block post. If you don’t have time to go to a nail salon to get your nails done, this product will make your nails look more civilized and even pretty, even if you don’t put on nail polish. 5 minutes on each hand while reading your favorite blog or watching a sitcom is sufficient. They last quite a long time. Multi Purpose Nursing Cover / Infinity Scarf: This one is for the nursing mamas. Maybe you are a new mom who loves to go out or a 2nd or 3rd time mom, who needs to take your older kids to school or to the park. You can’t handle all the things you need to pack. 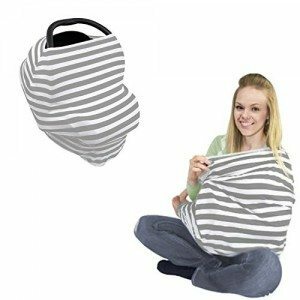 This 4-in-1 nursing cover is both an infinity scarf (no need to pack in the diaper bag), nursing cover, car seat cover and shopping car cover. 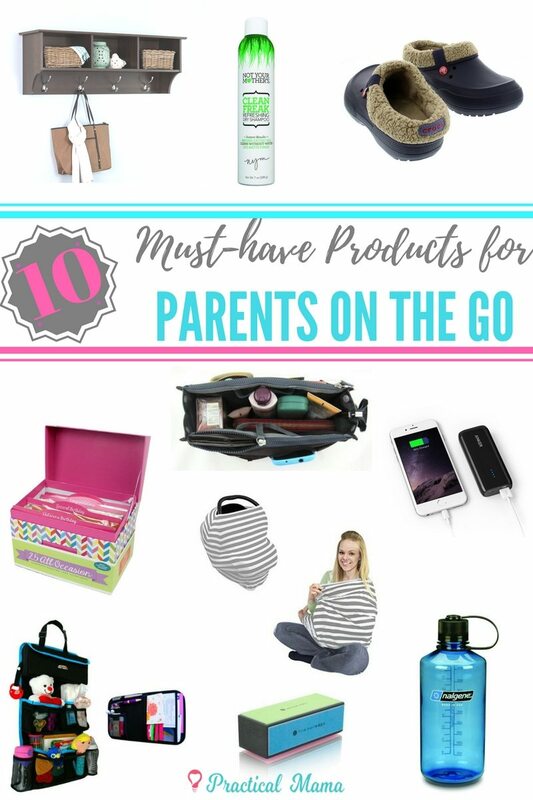 If you are a mom or dad living in the fast lane, let me know what’s your “must-have” item that keeps you going? 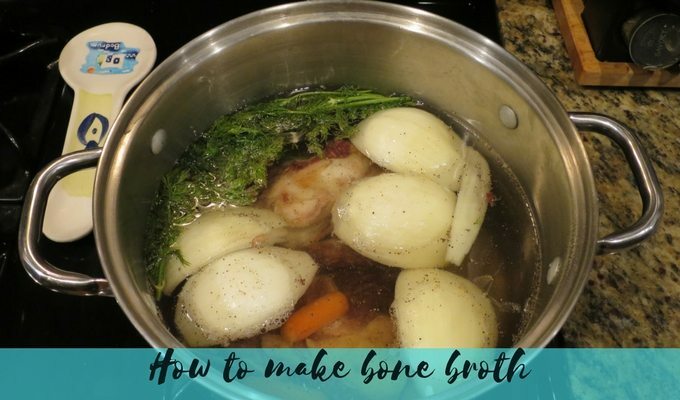 This is such a helpful post! I discovered dry shampoo last year and now I can’t live without it.I agree with you on everything yous said about it! Thank you, It also took me a while to get on the dry shampoo wagon but when I got on, boy, I’m literally a disciple. Got one at home and one in the office.